You want to know what’s glorious? TODAY IS GLORIOUS. 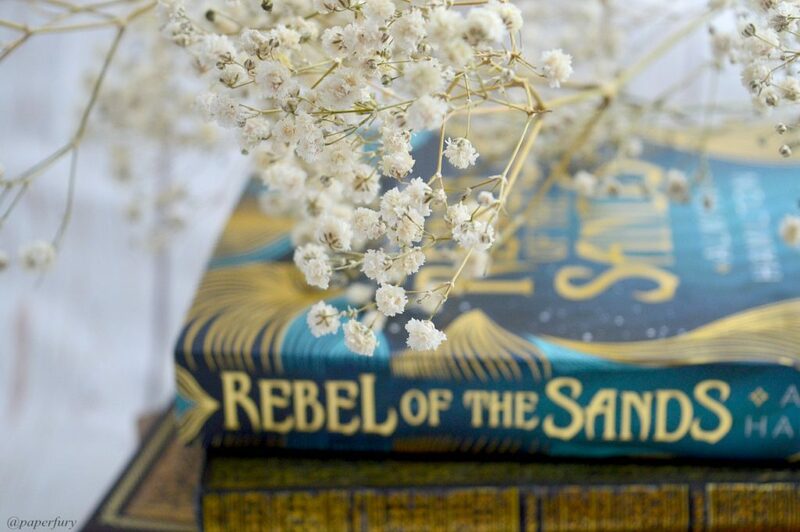 I’m extra incredibly shriekishly (shhh, that’s totally a word) excited to be plastering the goodness of Rebel of the Sands in your faces. This book was one of my top “I-must-have-this-book-in-2016-or-spontaneously-combust-with-longing” books and it did not let me down. 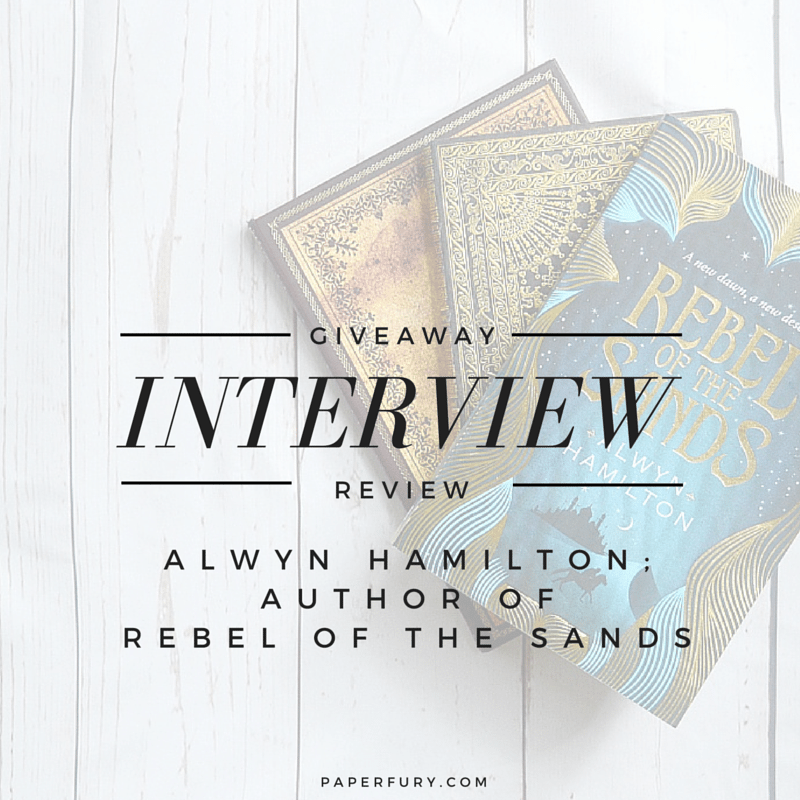 So today I am a) interviewing the author, Alwyn Hamilton, b) giving you a list of reasons WHY this book is everything, and c) having a GLORIOUS giveaway at the end. READY FOR THIS? OF COURSE YOU ARE. YEEHAAA! Alwyn Hamilton was born in Toronto and spent her childhood bouncing between Europe and Canada until her parents settled in France. She grew up in a small town there, which might have compelled her to burst randomly into the opening song from Beauty and the Beast were it not for her total tone-deafness. She instead attempted to read and write her way to new places and developed a weakness for fantasy and cross-dressing heroines. She left France for Cambridge University to study History of Art at King’s College, and then to London where she became indentured to an auction house. She has a badhabit of acquiring more hardcovers than is smart for someone who moves house quite so often. How long did it take Rebel of the Sands to go from inkling of an idea to published novel? Did it go through any ginormous changes? ALWYN: The very first inkling of an idea about a girl with a gun in a Wild West Meets Arabian Nights setting came sometime in early 2012. I started writing it towards the end of that year after letting the idea brew long enough that it had become an actual story. A first draft took about a year, then another six months of editing before I queried it. I signed with my agent shortly after and we did another four months of edits together. The book sold at the end of 2014 and had about another 8 months of edits before it reached the final state you can hold in your hands! So from idea to actually sitting on shelves it was 4 years, though not four years of non stop work! The biggest change from idea to execution was that when I was letting the idea brew, I planned out the entire story, all the way to the end of the Rebellion. I realized somewhere around 60,000 words in that it would never fit in a single book. So I added the plot of them stumbling across a destroyed desert city and reworked it so that I could end book 1 before it became a 300,000 word tome. The rest of what I had planned for the story has now evolved and goes in books 2 and 3. Can you tell us a little about how you got a book deal? ALWYN: Absolutely! On a Friday afternoon in November, after we’d been doing some editing, my agent told me that if I could finish some tiny little tweaks quickly she might be able to get in on desks in New York before the weekend. I cancelled my plans for the evening and managed to get home from work at about 8.30 and finish it off and send back to her about 9 p.m. And then suddenly it was out in the world. My agent told me to take up a hobby to keep myself sane as it might take a while. But maybe we’d hear back before Christmas. She was amazing and kept me posted about who had it and what they were feeding back. We heard back very quickly. On the following Wednesday we had my first call with an editor. In the weeks that followed I had calls with 7 more editors in the US and met with 4 in London and the sales in other countries started to build up. It was all a total blur. My agent set a date to hold an auction for U.S and U.K. I was a nervous wreck that Tuesday of the U.S auction, I don’t think I got any work done. Unless you count using the work printer to print out the 8 pitches sent for the book. The first round ended at 3 p.m that day, and it started to narrow down. The afternoon was a rush of emails and calls as I dodged around my office pretending to do my job. I worked in an auction house then, and we had a furniture sale that day. Around 6 p.m I had to go upstairs and find a fainting couch. My best friend came and collected me to be supportive, and took me home via Pizza as I stayed glued to my phone. On the train back to mine she read through all the pitches sent. She pulled out the one from Viking from the pile of 8 and told me it was her favourite one. I don’t know if that swayed anything in the great cosmic balance, but by 10 or 11 that night everything done and the book was with Viking. 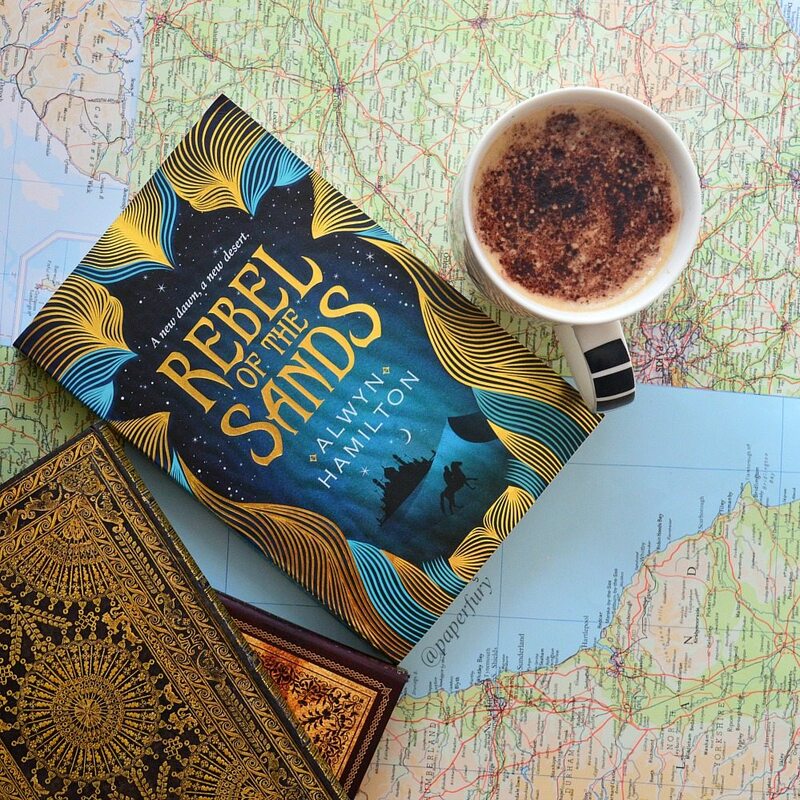 Do you have a favourite quote from Rebel of the Sands? ALWYN: So hard to chose from your own writing! And I’m looking forwards to seeing what quotes stand out to readers. But I really liked getting to use “lying is a sin” to mean so many different things depending on who is saying it. What is the toughest and what’s the easiest part of the writing process for you? Easiest Part has to be drafting. I love just pouring out words even if they’re bad and nothing makes sense. Hardest part…I struggle sometimes with editing small pieces. If I have to pull out a whole scene and write a new one that’s fine. But if it’s just doing a small tweak like pulling out a character, I find it quite tricky to close the gaps around where the change used to be sometimes. What’s the best writing advice you’ve ever received? And lastly! (The most important question.) Has any chocolate been harmed in the making of your novel? ALWYN: Most of the chocolate harmed has been at the bottom of a café mocha, accompanied by an almond croissant usually. But the odd piece of chocolate Guinness cake or pain au chocolat has been seen on the writing battlefield, for sure. Sounds absolutely delicious, to be honest…mmm CAKE. Ahem. Thank you SO MUCH for stopping by, Alwyn! It’s been amazing chatting with you! IT FLAWLESSLY MIXED PERSIAN FANTASY, MAGIC, SASS, AND GUNS. Fantasy is my life, honest, it absolutely is. But mix an epic fantasy vibe with a wild-western one and add in epic shooting skills?!? I AM SO CONVINCED. IT’S BASICALLY SET IN A DUSTY FANTASY WORLD WITH MIDDLE-EASTERN INFLUENCES. And actually reminds me of Blood Red Road, which is only my favourite book of nearly ever, by the way. We have weapons factories and GUNNNNNNS and shooting people — but we also have spirits and ghouls and terrible things lurking in the desert that like to rip your face off. #nice And sand. MUCH SAND. The cowboy western feel to it was absolutely my favourite. THE LOVE INTEREST, JIN, IS AN ADORABLE BUCKET OF SASS. Everyone is sassy in this book. I have zero complaints about that. We meet Jin when he stalks into a shooting game in the local tavern and competes against Amani (who’s dressed as a boy at that point) and they’re so stinkin’ cute together. And he also gets shot at. A lot. I do so like a book where everyone is shooting and bleeding. Ahem. DID I MENTION I LOVE THE SASS?!?!? LITERALLY AMANI AND JIN’S LEVEL OF SASS. THE ONLY DOWNSIDE IS THAT I NEEDED THE SEQUEL LIKE YESTERDAY. It was entirely amazing, okay?! I’m really happy that my all my expectations were met PLUS there were shoot-outs on trains and magical Djinn things and shrieky secrets spilling aaall over the sands. THANK YOU TO ALLEN & UNWIN FOR THE REVIEW-COPY. 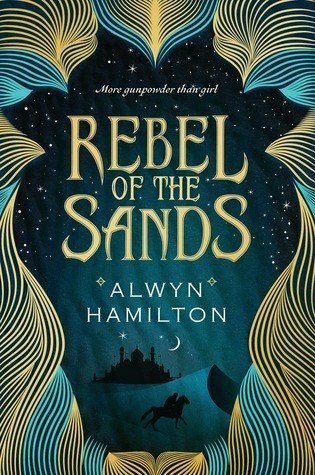 Rebel of the Sands by Alywn Hamilton is published March, 2016. She’s more gunpowder than girl—and the fate of the desert lies in her hands. Mortals rule the desert nation of Miraji, but mystical beasts still roam the wild and barren wastes, and rumor has it that somewhere, djinni still practice their magic. But there’s nothing mystical or magical about Dustwalk, the dead-end town that Amani can’t wait to escape from. Destined to wind up “wed or dead,” Amani’s counting on her sharpshooting skills to get her out of Dustwalk. When she meets Jin, a mysterious and devastatingly handsome foreigner, in a shooting contest, she figures he’s the perfect escape route. But in all her years spent dreaming of leaving home, she never imagined she’d gallop away on a mythical horse, fleeing the murderous Sultan’s army, with a fugitive who’s wanted for treason. And she’d never have predicted she’d fall in love with him…or that he’d help her unlock the powerful truth of who she really is. Thank you to Allen & Unwin for sponsoring this giveaway! okay, my little sand monsters: who is excited for this book?!? ARE YOU GOING TO READ IT? (your answer: yes.) have you read many other epic-fantasies with modern elements too? oh oh and tell me your most FAVOURITE sassy character of ever: go go go! Cool cover and I need this book! It sounds like it has a few similarities to the one I am writing, kinda. Squeee! I AM SO GLAD, THANK YOU, SHANTI. And I think there aren’t enough fantasises out there like this…because I want moooooore. This is such a brilliant idea for a mash-up of Persian and cowboy gunslinger. Seriously, that one quote you posted convinced me I really need this book in my life ASAP. And that cover. Oh my is it glorious or what? The gold. And the blue. And the sand *melts into incoherent cover love* I like this book already! YAYY I AM SO GLAD. And omg, isn’t it just the best combination in the world?! I really haven’t read anything like this before and I LOVE that. I love reading things that are excitingly different. :’) ALSO THE COVER IS SHINY AND SLIGHTLY RAISED IN REAL LIFE. <3 It is everything. AHEM! I shall move to Australia so I can enter the giveaway because I MUST have this book. OMG ALL THE SASS DYING DYING DYING. I think I’m already half in love with this novel. And that sounds like an absolutely giddy process re: auctioning the book — that pitch = the BEST THING EVER. So YES OF COURSE I SHALL READ IT. YES YES I FEEL LIKE YOU MIGHT LIKE THIS ONE. And plus that cover is like shiny and gold and glittery and basically my dragonish heart is so happy. :’) This book is soooo a ME kind of story. DID YOU JUST ACUSE ME OF BEING YOUR FAVOURITE SASSY CHARACTER??!? I ACCEPT. AND ALSO GIVE CAKE. I MIGHT EVEN GIVE YOU A SMALL PLANET WHEN I RULE THE UNIVERSE. Most welcome. 😀 Good luck! I’m sooooooo excited for this one. Like, a LOT. I mean, that gorgeous cover aside, there looks like so many things to love about this novel. And there’s sass!? YES, PLEASE. Oh my God, this looks really good! Definitely one for the TBR. Favourite sassy character????? Oh God. I love sassmasters, so this is the hardest question ever. Sticking strictly to novels, it’s probably Nico Di Angelo. Or Cole St Clair. Oh Nico? YES TO NICO. He is marvellous when it comes to sass. :’) Actually, come to think of it…Rick Riordan’s characters are just amazing for sass?! Ahem. I’ve been wanting this gorgeous book for a while because that world sounds amazing, but there’s also sass and it’s faced paced?! GIVE ME THE PRECIOUS! The interview was amazing & thank you so much for the giveaway! I’m like pretty sure we do. Because SHINY. WE LOVE SHINY. SHINY IS EEEEEVERYTHING. That exchange you quoted has moved this book from “sounds interesting” to “OMG MUST READ” for me. *awards self shiny sticker* MY JOB HERE IS DONE THEN. I need to have this book in my life. Pls. I want it. I could cry at this exact moment. It doesn’t matter. 😂 If I draw you, I’ll just draw again, hehe. P.s. Loved reading some of your other blogs! Think I’m going to have to jump on board and read regularly. Aww, thank you, Michaela! CAKE FOR YOU AND MUCH WELCOME! GET A DRAGON TO SPEED YOU ON YOUR WAY, MY FRIEND. THIS BOOK NEEDS YOU IMMEDIATELY. YESSS. It’s kind of unique, right?! I don’t read many fantasies with modern(ish) elements. I AM IN LOVE. I have yet to read this book but I’ve already heard so much about it, I can’t wait! Also, awesome interview, Cait. I loved your questions, especially the one about the chocolate, and it was really interesting to read how Alwyn Hamilton got her book deal. Ahhh, don’t worry. 😂 I’ll just re-draw if the winner is American. And you’re NOT ALONE. I literally almost always pull an American for my Aussie-only giveaways several times, hehe. BUT I HAVE AN INTERNATIONAL GIVEAWAY COMING SOON SO STAY TUNED!! It’s okay, though. I HAVE TO READ THIS BOOK THOUGH. Sassy characters give me life. I’m a broke little potato, though, and that’s really bad when you’re a fangirl/bookworm. I need books and fandom merch! What do you mean they cost MONEY?!?!?! (I’m going to be a terrible adult). ANYWAYS, THAT COVER. *fans self* IT IS PERFECTION AND BLUE AND SANDY AND ASDFGHJKL. It’s so cool that you got to interview the author, though! I love hearing author’s publication stories. It gives me hope (and also makes me hopeless because it’s so hard to get published) that I will achieve my dream of taking over the world. Excellent post as always, Cait! GOOD. MY JOB HERE IS DONE THEN. 😂 But yes yes! Just pop over to Australia and win my giveaway and pet a kangaroo. DO IT, MARY. Awesome post! I am 50 pages into this book right now and LOVING IT SO FAR! It’s unique and pretty awesome, I can’t wait to finish!! The cover art/Arabian nights vibe had me interested, then when I started it I was like wait…is this Western?? I’m finding I like the mixed combo pretty amazing so far!! Admittedly it makes me want to sit down and write my own “wild west” book…and I’m pretty jazzed about that HAHA! It’s always nice to read how a book goes from idea to finished product 🙂 What a journey! God your pictures are gorgeous! Photo game is so strong. I just finished a book this morning and Rebel of the Sands is up next. I cannot wait to dive into this world of sand and sass! EEEP. THAT MAKES ME SO HAPPY. THANK YOU. Omg, I assume you’ve started it by now so I hoooope you love it!! THE SASS IS PERFECT. I want to read this book so. freaking. badly. And, yet, I be broke. Also, how the author reacted for the auction was basically how I would have reacted. Obsessively checking my phone, wandering around in a daze, occasionally feeling slightly light headed because OMG ALL THESE PUBLISHERS WANT TO PUBLISH MY BOOK. I actually think that if I ever manage to get a book published I will react like that regardless, because the idea that even one publisher would want to publish one of the messes I write would blow my mind. I’m so sad this is AUS only! My library hasn’t ordered the book yet. >.< I was already looking forward to reading it because of the cover and because you liked it so much, but I"m even more excited to hear about the sass. I love sassy characters! This book looks AMAZING! The cover is just filled with gloriousness. I am so going to read it! Also, I totally entered the giveaway before realizing it was Australian only. Whoops. BUT YUS YOU STILL NEED THIS BOOK SO MUCH. Plus the cover is shiny and slightly bumpy so you can pet the shininess and feel glorious. Muuuust persuade my sister to read it. It is awesome. WE MUST CONVINCE THE WORLD TO READ IT! HUZZAH! Okay, so this is a fabulous interview. 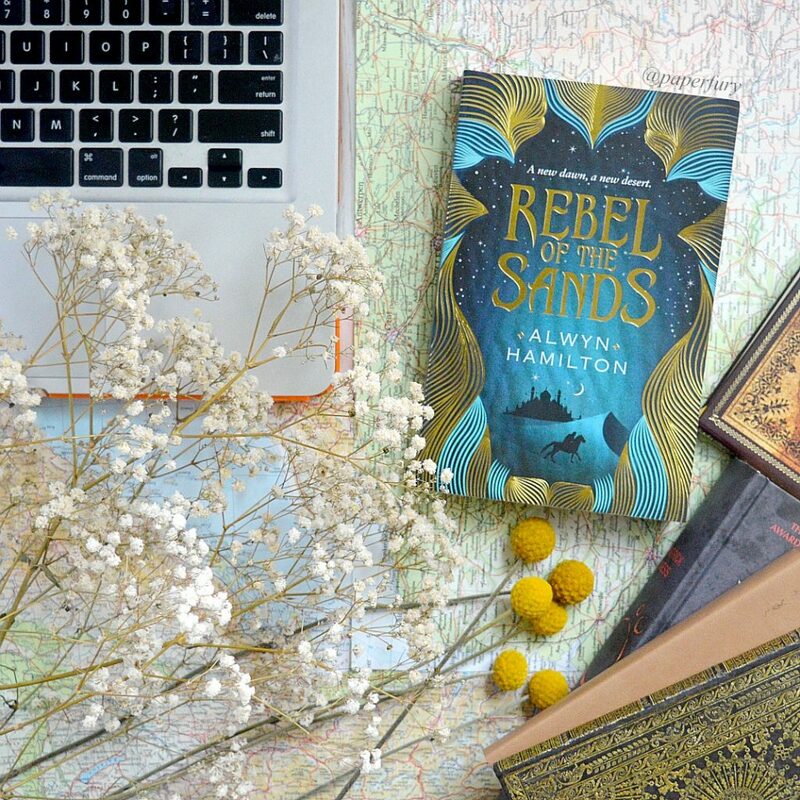 You ask awesome questions, Cait–and I loved reading Alywn’s answers about writing Rebel of the Sands, the publishing process, etc. 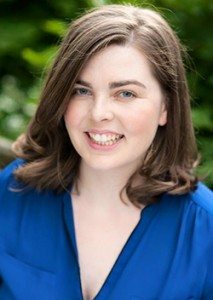 Hearing different authors talk about their path to publication is always so interesting to me, especially because as readers and writers some of us might know the basics of “how to get published,” but not a lot of people get the behind-the-scenes look unless they’re in the middle of the process themselves. 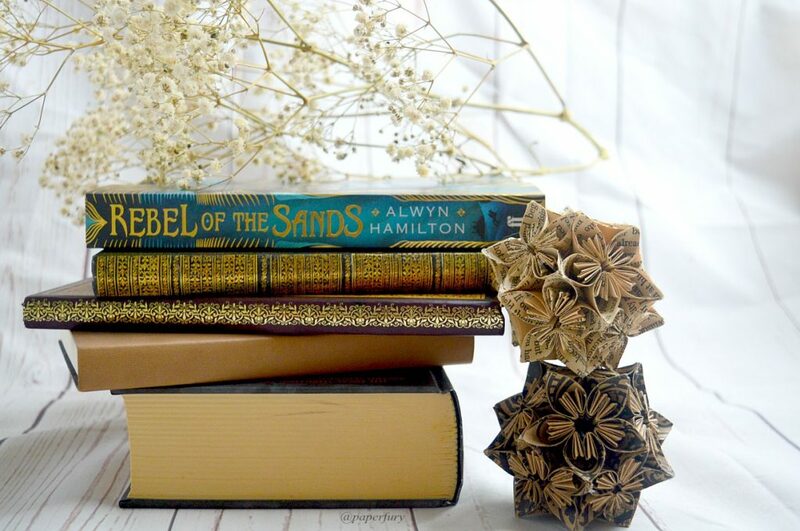 Reading about the calls with editors and bidding auctions for Rebel of the Sands is so fascinating, and what a cool story! Also, this book sounds like it was written specifically for you, Cait, haha. 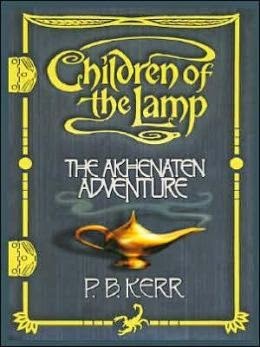 High fantasy isn’t always my thing, but I may give this a try–the whole Wild West/Persian mythology combo sounds like an interesting one. I’ll keep it in mind! Also, in answer to your question, offhand I can only think of two fantasy worlds that use modern (or at least semi-modern) technology–Philip Pullman’s His Dark Materials trilogy (which with the whole parallel universe thing is probably more sci-fi, but shhhh…) and then Leigh Bardugo’s Grisha trilogy (and the Six of Crows duology). It’s always interesting to see a fantasy world that doesn’t revert to the usual ancient swords-and-shields setting, isn’t it? Eeep, I’m glad you like my questions! 😂 I always struggle to find the perfect ones, so I end up going with what I’m nosey about. *takes notes so can get a book deal later on* hehe AHEM. I find it intensely interesting to know about the behind-the-scenes-publishing part too. Because it’s rarely the same from author to author, right?! You'd call the Grisha books modern?! Eh, I mean, I guess they use guns so YOU'RE RIGHT. 😂 I really do like that mix of not-so-ancient-plus-epic-magical-fantasy. <3 I WANT MORE OF IT FOR SURE. ahhhhhh I got a review copy of this one and I am SUCH A BUM for not starting it earlier!!! After reading your review, I want to sprint home and read it NOW. (why do I have life obligations tonight?????) The main character sounds FABULOUS, and I LOVE sassy characters, so Amani and Jinn sound right up my alley. Like gah, I know I’m going to love them already. And the setting sounds SO cool as well! I have been on a MAJOR fantasy kick lately, so hopefully this will continue to fuel it. I love the story of Alwyn getting her book deal! Always so exciting to hear those stories. Also four years from idea to published book?! I’m always astounded by how long publishing takes, dang. YES YES GET ONTO THIS BOOK ASAP, ANEEQAH!! *flails wildly* Life obligations though. Gah. You clearly need some dragon secretaries to take them over while you read. It’s the only way. *nods* Oh oh I’ve been on such a fantasy kick too!! I WANT ALL THE MAGICAL FANTASY STORIES. BUT YES I follow those Pixar steps all the time. They’re so useful. I know right?! Me too. 😂 I always ask that question because I’m super curious. hehe GOOD LUCK FOR THE GIVEAWAY! I am really excited to read this one! It looks and sounds quite interesting. IT IS. I PROMISE IT’S UTTERLY AMAZING.! Yesssss…and that’s kind of a unique combination too, right?! I hadn’t read it until this and NOW I WANT MORE. THIS IS MARVELOUS. GLORIOUS. And you have positively convinced me that I NEED to read this book. Aaggghhh! Thanks for sharing the interview and for the giveaway! The sass is just so ON POINT OMG. I was definitely laughing and I ship Jin and Amani SO HARD. And the cover… *pets it* It’s ever so shiny. I do want to read this book. (okay, okay, that was unnecessary.) Sassy characters = awesome! My favorite sassy character is probably Britt Arthurs, from K.M. Shea’s King Arthur and Her Knights series. Omg I haven’t even heard of that series but if it has sassy characters THEN I NEED TO LOOK IT UP EEEEP! Eeeep, I hope you enjoy it if you get your hands on a copy! IT IS ABSOLUTELY WORTH IT, OMG. OMG, did you say Blood Red Road? I’m in. I’m seeing so many reading this one at the moment and haven’t bought a copy yet. It sounds incredible. I actually didn’t know book rights are auctioned off, her publishing story is so charming, it’s a credit to her after all of her hard work. I can’t remember the last time I didn’t hold a fantasy book in my hands that couldn’t be used as a housebrick, so one just over 300 pages that is furiously paced and has awesome world building. Yes please. Awesome review smushy and wonderful interview. Glad no chocolate was harmed in the process. Ikr?! Why do fantasies insist on being the size of Mt Everest. IT’S EXHAUSTING. AHHH! I NEED TO READ THIS! Also, great interview! IT IS ABSOLUTELY 100% WORTH READING. I PROMISE. Not only is the cover beautiful, the story sounds awesome. I must have it! YES YOU MUST. YOU WANT IT, SKYE, I PROMISE YOU DO. Yes, I so want to read this one! I put in a NetGalley request, but I haven’t been confirmed (or denied) yet. It’s definitely one I’ll be on the look for at our library if I can’t get an ARC. Fingers crossed that you get approved for it!!! And now that you say it reminders you of BRR I want to read this book even more! Just wow. And SASS for the win! ZOMG YOU NEED IT, ASHLEY. I think it would be your kind of book, tbh. :’) Sassssssss. I just finished this book yesterday, and I loved it SO MUCH! I cancelled everything on my social agenda to finish reading this. HAHAHAH. OMG YOU ARE AWESOME.😂 That is perfect, though, truly. Books over socialising any day. I’m actually in the middle of reading this one at the moment, and I’m really enjoying it! I think it’s such a unique novel, and I’m loving the mix of elements as well. It’s so unexpected, and it’s so fun, and it’s definitely got the sass going for it – and I’m curious to see how this is all going to end! (Omg the Wrath and the Dawn is another absolutely EXCELLENT book and I recommend it a zillion percent. Just sayin’.) 😉 YES YOU NEED BOTH OF THESE!! Gah, I’ve been drooling over this book since I first heard about it, and I’m hoping my library will pick it up soon. It looks SO good, and it’s definitely something that would be right up my alley. Also, that cover is gorgeous. I’m not going to lie–that cover is 88% of the reason why I want to buy 10,000 copies of that book and use them as wallpaper. I really enjoyed reading this interview! Your questions were great, and just adlkfjas;ldfjasd;leks. That is all. Thanks for doing the interview! THE COVER IS REALLY GORGEOUS IN REAL LIFE, I MIGHT ADD. It’s shiny. It glistens in the right. It is miiiiiine. *hugs cover* Ahem. Definitely use them as wallpaper, or better yet: make a dress out of them. Or a nice shiny glittery paper hat. So many possibilities. THIS IS THE BEST BOOK IN THE WORLD! LIKE, LEGIT! I LOVED EVERY SECOND OF IT, AND I HAD TO KEEP PAUSING FROM PURE AWESOMENESS! I agree with you, I NEED THE SEQUEL. Also, I need it to be like 10,000 pages long. AMAZING INTERVIEW! What a gorgeous cover! Also that’s such a good interview, Cait and Alywn! Thank you! I cannot wait for this! Sassy charries are the b e s t yesyes.